A Sumatran tiger at the Melbourne zoo. In Indonesia, forest destruction for palm oil production is pushing Sumatran tigers to the edge of extinction, with as few as 400 left in the wild. 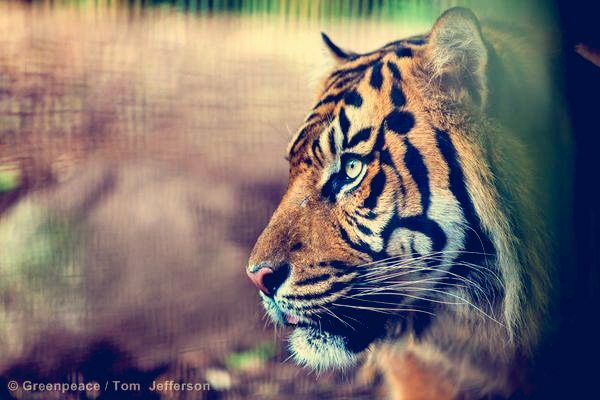 Companies must commit to zero deforestation and end their role in tiger habitat loss. Effective immediately, Wilmar will not engage in development of HCS, HCV, or peat, nor knowingly source from suppliers engaged in development of HCS, HCV, or peat. Wilmar International – the world’s biggest palm oil company – has committed to a No Deforestation Policy. To put this into perspective, palm oil is the single biggest cause of deforestation in Indonesia and a growing threat in places like Africa. Wilmar controls over a third of the global palm oil trade; but by banning its suppliers from destroying forests and peatlands, Wilmar’s policy could be an important step toward transforming the palm oil sector. You might recall Greenpeace’s recent work exposing Wilmars forest scandals. This included ourLicence to Killreport in October that exposed destruction of tiger habitat in both Wilmars own concessions and its suppliers operations, and investigations in November that exposed clearance of peatland and orang-utan habitat by Wilmars notorious supplier,the Singapore-listed company Bumitama. This is potentially a huge win for Indonesias forests; but Wilmar must be judged on its actions, not just its words. Wilmars policy could be a landmark win for the worlds forests and the people that depend on them for their livelihoods. But it could not have been possible without the millions who power Greenpeace campaigns – people like you! A movement including celebrities in the US, grunge rockers in Jakarta, and activists in Norway are demanding the palm oil industry clean up its act. From consumer companies such as Ferrero and Unilever, producers such as those in the Palm Oil Innovation Group, every link in the palm oil supply chain is on the verge of transformation. We are one step closer to Zero Deforestation. But the hard work for Wilmar starts now. These are great words, but words on paper only mean something when they translate into action on the ground. For the as few as 400 Sumatran tigers remaining in the wild, action to end deforestation must come now. Wilmars first test is how it will deal with palm oil suppliers still engaged in ongoing forest destruction and social conflict. Take Ganda Group for instance, a palm oil supplier that is also closely connected to one of Wilmars co-founders. Greenpeace investigations have exposed how this company violates all Wilmars new principles. Violations include current forest clearance, illegal development of deep peatland, and social conflict. Forest clearing for oil palm development inside PT Agriprima Cipta Persada (Ganda Group) in Papua. Greenpeace analysis of satellite images reveals large-scale deforestation within the concession continued in November 2013. Will Wilmar demand that Ganda immediately stop its destructive practices and commit to a No Deforestation policy? Support for good governance is fundamental to transforming the palm oil sector. Critically, the policy needs to include a strong commitment to comply with national laws and international conventions and agreements. It should also include strong anti-corruption and anti-bribery commitments. It should address other legality issues such as operations on deep peat (which are legally protected) or concessions allocated on moratorium areas. Given the palm oil sectors rapid expansion into the island of New Guinea and Africa, the policy must commit to transparency in all land acquisition negotiations and agreements, and introduce measures to prevent land grabbing. Food security for local communities must be maintained. The policy must ensure that growth by the sector is environmentally and socially responsible. Prior to any new investment in expanding processing capacity, the company must ensure that all supply can be met from responsible sources, compliant with the new policy. Independent, third-party verification of supplier compliance, including smallholders, is essential to ensuring the credibility of the policy implementation. Transparency is fundamental to stakeholder confidence. Transparency, including public access to all relevant documentation about supplier operations, must be ensured. The policy must address pesticide usage, including banning pesticides such as paraquat, and should ban the use of GMOs. However, with its new policy, Wilmar is setting an example others in the sector should follow. 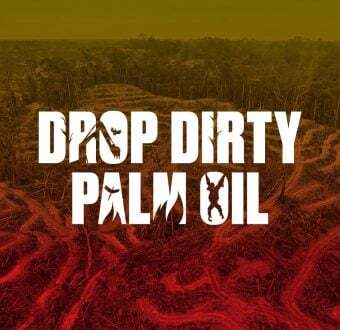 Other palm oil giants such as Cargill, Musim Mas and Sime Darby are left exposed and must respond to the massive changes taking place in the palm oil sector. Corporate consumers – especially those in ourTiger Challengesuch as Procter & Gamble, Colgate Palmolive and Reckitt Benckiser – must also step up to the mark. They must now guarantee to consumers – people like you and me – that their products are free from forest destruction. We know its possible! Find out how you can get involved and help us save Indonesias forests.